NEXT | The Queue: Snow day! In case you’ve been occupied, we’re heading towards the release of the Crucible of Storms raid next Tuesday, April 16 and with that raid we’ve already seen quests that introduce us to the story, the why are we doing this that I as a player always appreciate. I wanted to go into details on those quests and how they lead us into the raid, with a warning that the discussion will of course contain spoilers for the quest chain — so if you don’t want said spoilers until you’ve gotten a chance to finish the quests yourself, consider yourself warned. There’s a nice overview of all the quests over on Wowhead, so we’ll be using that to facilitate discussion. Again, there will be spoilers — if you haven’t complete the quests and want to go in fresh, come back after. In order to start the quest chain that leads one to the Crucible of Storms, you have to complete one of the Naga Attack world quests, although the Crucible quests aren’t a direct continuation of said world quest. Instead, while killing Naga mobs for that quest, a quest item — the Azsharan Medallion — will drop and you’ll be instructed to take it to Collector Kojo. He’ll give you the Orders from Azshara questline, and if you’re not a Priest who already has it, you’ll meet our old friend Xal’atath which is much less talkative after the power of the Artifact was drained to save Azeroth from Sargeras’ oversized blade in Silithus. Luckily, you can murder some Naga and the dagger will slurp up their life essence to empower itself again. If you’re a Priest and you already have Xal’atath, you’ll get a slightly different quest text and response from Xal’atath. As we’ve come to know, for a cursed tool of the malevolent Old Gods, it’s a bit of a smooth talker. It then tells us that it does in fact know what the Naga are up to — to purge the world of N’Zoth’s enemies, they’re seeking three relics and Xal’atath wants you to get them first. As your evil knife friend (or possibly girlfriend, if you’re a Shadow Priest) tells you, these three relics of power are the Void Stone, the Trident of Deep Ocean, and the Tempest Crown. After using the Void Stone to empower itself further, Xal’atath manifests a body — a lady Void Elf form, suitable for a tool of the Old Gods I suppose. Once you gain the three relics by slaughtering those that hold them — the Tempest Crown in particular is an entertaining quest due to Xal’atath’s one-sided argument with Toatana the giant crab monster — Xal’atath leads you to the Precipice of Oblivion in Stormsong Valley. And of course you go, because with a name like that how could you possibly refuse? I mean, sure, a talking knife has just led you on a murder spree and is now taking you to the Precipice of Oblivion, of course you’re gonna go. In a move worthy of all your curse your sudden but inevitable betrayal memes, it turns out that Xal’atath (gasp!) hasn’t been entirely honest with you (double gasp!) and has been working for N’Zoth this entire time. It’s a move that makes me want to break out that old triple gasp but I’m afraid I’ll pass out. And here, for all my snark, is the moment where Battle for Azeroth embarks on a course I don’t think World of Warcraft has ever really fully embraced, because N’Zoth? He’s a big fan of yours. Xal’atath didn’t need those relics at all — she needed you. Because you were the prize she was offering N’Zoth, and it’s you that N’Zoth wanted most of all. Xal’atath: Hear me, God of the Deep! I have brought you the Opener… the Bringer of Truths… the Torch That Lights the Way! Xal’atath: Honor our bargain… free me to find my own fate! N’Zoth: Go… but the blade must remain… to serve my will. Xal’atath: A fair exchange. Shadows guide you, my dear friend. Xal’atath: We will meet again… I am certain of it. N’Zoth: I have dreamed your destiny, mortal. N’Zoth: The hour is close at hand. N’Zoth: That which was sunken shall rise. N’Zoth: All that were sleeping… shall be awakened. N’Zoth: Receive my gift and see all truths before you. The specific name that Xal’atath calls the player character — the Torch That Lights the Way — is reminiscent of the language used by Il’gynoth in the Emerald Nightmare raid. “Five keys to open our way. 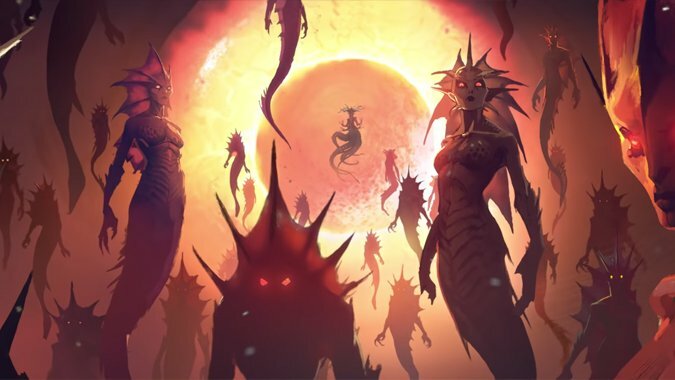 Five torches to light our path.” Considering what happens next — namely, that N’Zoth grants you his gift and places a cyclopean crown upon your brow, one that only other players who’ve received the Gift of N’Zoth and not had it cleansed can see. 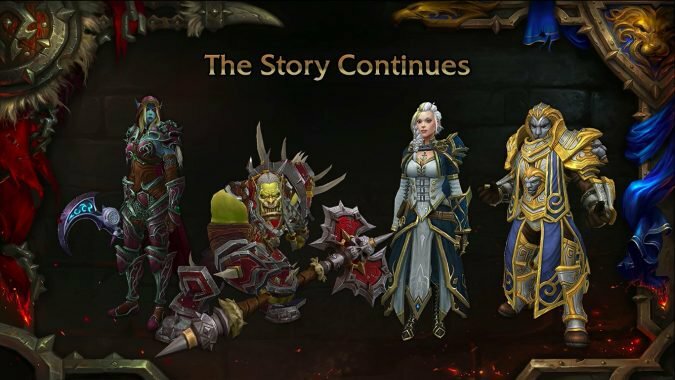 And that’s the biggest decision we’ve yet had this expansion, I think: you can choose to tell Brother Pike or Talanji, depending on your faction, to have the Gift purged from you. Do so, and you no longer see the Gift of N’Zoth on the foreheads of others who have accepted it, which implies that in game this is intended to be all part of a widespread cult in service to the Old God, and you can choose to be part of it or not. 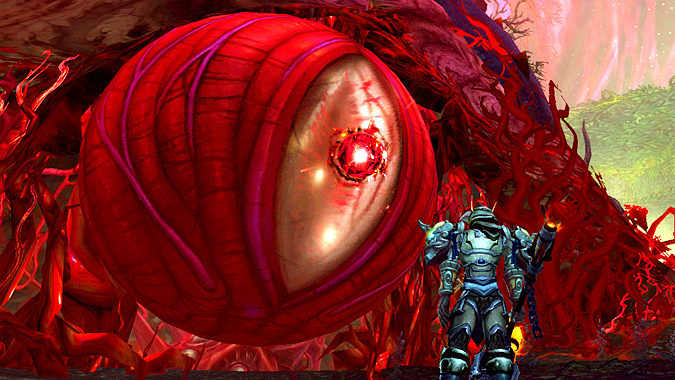 It should be pointed out that Il’gynoth was a part of N’Zoth all along, and Xal’atath is the one who told us that back in the Emerald Nightmare raid. So it would seem possible that there are, canonically, five torches to light the way, and the PC is but one of them. Who are the other four? The abandoned dagger body of Xal’atath is left behind at N’Zoth’s insistence when the Old God frees the entity within it, and later it appears in the hands of Sylvanas Windrunner — is she another such torch? Is she the one Il’gynoth spoke of when he said Her heart is a crater, and we have filled it and if so, why did the Void whisper to Alleria that Sylvanas must be destroyed? N’Zoth speaks of his gift letting his chosen see all truths before them — is it this seeing of all possible outcomes what can lead the void to subvert Sylvanas as one of the Torches and yet seek her death? And is that at all related to why Bwonsamdi wanted Talanji to behead Sylvanas? 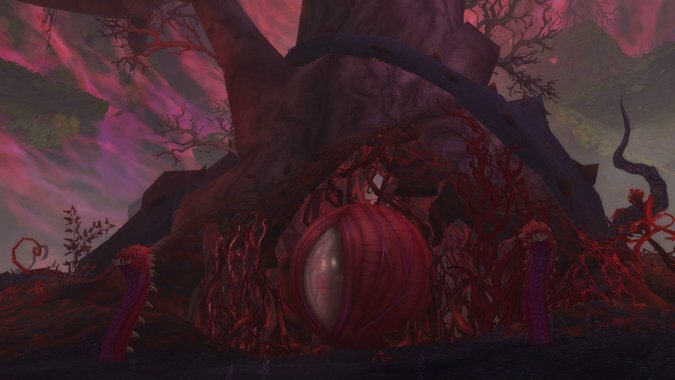 Il’gynoth’s whispers said cryptic things about a variety of other characters as well, although their identities were masked behind cryptic allusions. To find him, drown yourself in the circle of stars. The boy-king serves at the master’s table. Three lies will he offer you. Her heart is a crater, and we have filled it. At the hour of her third death, she will usher in our coming. From the earth, he draws strength. Our earth. Our strength. Now, keeping in mind that Xal’atath has revealed that Il’gynoth is a part of N’Zoth, and N’Zoth and Xal’atath have said that you are one of the Torches That Light the Way, could the others be Anduin, Magni, Sylvanas, and Baine? 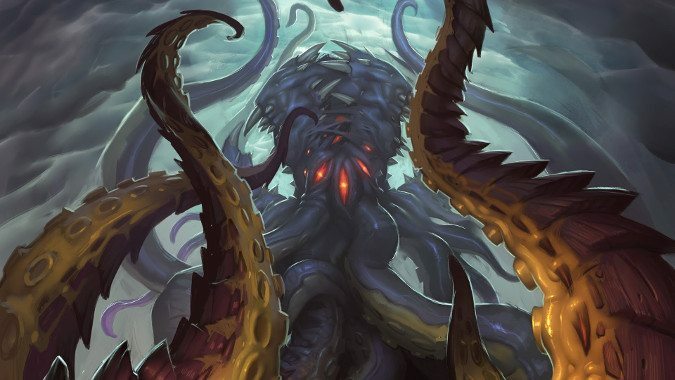 After all, if you’re one of the Torches, you don’t seem to have to be willing — N’Zoth doesn’t seem to care if you purge his gift or not, after all. The others could, without intending it, be all part of the plan. Baine turning against Sylvanas could be a way to usher in the hour of her third death, and Anduin could be seen to have offered you a lie when he sent people to Dazar’Alor expecting it to end the war. And think about it — you helped destroy Deathwing. You stopped Yogg-Saron and C’thun. Who has proved themselves more worthy to usher in the way than you? You stopped Sargeras. No one has more potential to bring about the nightmare future than you, not even the leaders of the Horde and Alliance. If you play Horde, you chose to help Sylvanas light Teldrassil on fire — perhaps the moment when she became one of the five Torches? At last, World of Warcraft seems to be grappling with how disruptive we, the players really can be, in a way it hasn’t ever since Garrosh blew up the Vale of Eternal Blossoms and we just all kind of shrugged at how he couldn’t have if not for us. Because others might well be Torches. But you? You are. N’Zoth has chosen you. N’Zoth approves of you. You will awaken the Old Gods. You will usher in the end of the world.